Screen print on corflute board, t-shirts, polo shirts, windcheaters, singlets, fridge and car magnets, bumper stickers, can holders, caps, flags, PVC banners, safety and general signage, mouse mats, umbrellas, cotton bags and promotional products. Quality garments and stock available for printing, just let us know what you require. Contact us for prices. 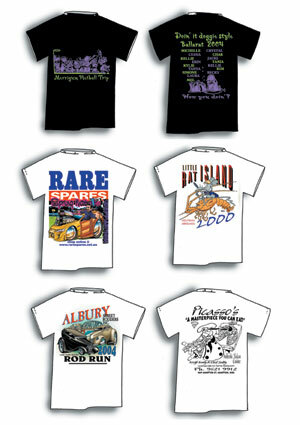 Dye Sublimation printing is ideal for short print runs on polyester shirts. Computer rendered artwork and digital photographs can be printed on white coloured fabric.